Rereading Sylvester by Georgette Heyer this week has made me so happy. There are a number of reasons why I pick the books I do: to learn something, to be challenged, to be distracted, etc. But reading Sylvester reminded me of my favourite reason of all: to feel a delicious sense of joy bubbling up inside me, from the very first page to the very last. Sylvester, or The Wicked Uncle (first published in 1957) is, I think, one of the best novels Heyer wrote. I rank it only slightly behind A Civil Contract and The Grand Sophy in my affections and there is every possibility that it will surpass both of those in coming years as I seem to love it more each time I read it. And I reread it as often as I can. Refusing the shortlist he had prepared, the dowager duchess recalls that during his childhood she had hoped for a moment that he might marry the daughter of her dearest friend once they were both grown. Amused by this, Sylvester determines to go and meet this Phoebe Marlow and discover if they will suit. When Phoebe, who had met and promptly been forgotten by Sylvester during her season in London, hears that he is coming to visit with the intention of making her an offer (a scheme her thoughtless stepmother reveals to her), she is appalled. Not only does she not credit the idea that he could want her for a wife – at nineteen, she is clever and excellent with horses but has no beauty or accomplishments – but she also knows that her opinion on the matter will be of no importance. Easily intimidated by her stepmother, Phoebe knows that if Sylvester makes her an offer she will be forced to accept. So, after his arrival, she does the only thing she can think of: with the help of her lifelong friend Tom Orde she runs away from home, heading to her grandmother in London. Of course, all does not go to plan. For starters, Sylvester had realised soon after arriving that the silent, sulking young woman would be no wife for him. As soon as the family learns of Phoebe’s disappearance – believing at first that she and Tom have eloped – he makes his excuses and is thankful to get away. But the weather is awful and he finds himself forced to stop at an inn, which already has two other occupants: Phoebe and Tom Orde, who were forced to stop after their vehicle upset, breaking Tom’s leg and, to Phoebe’s greater concern, injuring one of the horses. Forced to get to know one another under these unconventional circumstances, Sylvester and Phoebe discover that though they might have no interest in marrying one another, friendship is a definite possibility. Impatient with Sylvester’s imperious moods, both Phoebe and the delightful Tom give their highborn friend the set downs he so desperately needs whenever he attempts to look down his nose at anyone or acts without considering the impact his actions may have on others, disarming Sylvester who had, until then, thought he knew himself very well. But he is not too proud to accept their criticism, though he cheerily returns the favour. A firm and surprisingly intimate friendship develops between them all on this equal footing and when Phoebe at last departs after the roads are cleared, she is running away from her stepmother only and not Sylvester, whom she looks forward to seeing again in London. In London, their friendship surprises Sylvester’s friends and family, who have never seen him take this level of interest in a young woman. The two, though they dare not admit it, are falling in love and all seems to be going well until the secret Phoebe has been keeping from him is finally revealed: having passed an uneventful first season the year before, Phoebe made the most of the hours she spent observing the Ton and has since written a lurid gothic romance featuring thinly disguised society folk as characters. And Sylvester, cast as the wicked Count Ugolino, is her villain. The casting had more to do with the extravagant slant of his eyebrows than any character flaws but due to an unfortunate coincidence the key plot elements of The Lost Heir are mirrored in Sylvester’s role as guardian to his young nephew. The book is immediately popular and it is not long before Sylvester’s sister-in-law, Lady Ianthe Rayne, is convinced that the book was written as a warning to her to remove her son from Sylvester’s reach. In refuting this, Phoebe unwittingly reveals herself as the author and, of course, Sylvester finds out, putting an end to the progress of their relationship. From there, the book becomes a delicious satire of the gothic novel, with Tom and Phoebe reluctantly dragged along – almost kidnapped, really – when Lady Ianthe attempts, with her very foolish new husband, to spirit her son away to France without Sylvester’s permission. Horrified that her book could have inspired such madness, Phoebe finds herself taking care of Edward, Sylvester’s rambunctious six-year old nephew, since Lady Ianthe is first too ill to do so herself and then simply too ill-at-ease with her son, who had always been cared for by nurses. Lady Ianthe and Sir Nugent are comic rather than heroic and when a livid Sylvester arrives on the scene he is greeted by anyone of sense as the saviour rather than the villain of the piece. All are returned safely to England but it takes a while longer for Sylvester and Phoebe to reconcile, though when they do it is perfectly written. This may not be my absolutely favourite Heyer (yet) but the final scene between Sylvester and Phoebe (aided by his mother) is my favourite romantic climax in any of her novels. I feel so nervous every time I read it, even knowing what is about to happen. That is how invested I am in their relationship, that is how well Heyer evokes the tension and anxiety both characters are feeling before their confrontation, knowing that they love one another but uncertain of how to move forward together. There are so many things to love about this novel. It is wonderfully plotted, moving along at the perfect speed with no odd diversions or unnecessary meanderings. It makes excellent use of Heyer’s extensive knowledge of the Regency era and Regency slang without those historical details becoming cumbersome. It has a wonderful relationship between the hero and heroine that allows both to grow over the course of the novel and to confront how little they know of themselves. It is funny and smart and never, never dull. But mostly, it has truly magnificent supporting characters: the silly, stylish and well-matched Lady Ianthe and Sir Nugent; Phoebe’s demanding grandmother (who is also Sylvester’s godmother); Sylvester’s suffering but stoic mother; Sylvester’s rebellious nephew; and, most of all, Tom Orde, Phoebe’s lifelong friend and surrogate brother, who is full of good sense and is frustrated to no end by the unnecessary agonies Phoebe and Sylvester put themselves through. Tom is perfection. He is far to solid himself to ever be the hero of a Heyer novel but he is a perfect sidekick and I like to imagine he got the perfect ending he deserved, with a dependable, good-natured wife to give him many dependable, good-natured children and to support him when he became squire after his father’s death (at, one hopes, an advanced age since Mr Orde was also an excellent man). Since Phoebe and Sylvester’s happiness is assured, Tom is the only one left to worry about. It is a wonderful novel and it was a very happy way to end A Century of Books. Yes, this is book #100 and I am so pleased that I saved it for last. It was a fantastic reading project and it deserved to end on a high note. I’ll talk more about the project as a whole on the weekend but for now I am just going to savour the fact that I am done. Nothing could be lighter or more enjoyable than Heyer! If you don’t finish out 2012 with one of her books, then may I suggest starting 2013 off with one? And thank you for the congratulations! Congratulations on completing the project, and ending it so well! This book also has I think one of the most devastating scenes in all of Heyer, when Sylvester walks away from Phoebe on the dance floor. It sounds so simple, and it is so heart-breaking. I find it difficult to forgive him for that! Thank you, Lisa. I saved this up until the very end so that I knew I would finish the project with a book I loved. It was a very good plan! And yes, that dance scene is so painful to read. I always choke up reading it, being both angry at and sorry for Sylvester and Phoebe. Obviously, Sylvester is the one saying awful things but he is at least trying to help Phoebe by making it appear to others that they are on good terms. It doesn’t quite work but the intention was there. Lisa, read the book again. It’s not Sylvester who walked away from Phoebe on the dance floor; it’s the other way around. I can’t believe I haven’t read this one. Time to remedy that! Get to it, Elizabeth! You have some delightful reading ahead of you. What an enthusiastic review! Confession: I haven’t read any Georgette Heyer. No, I lie. I have read some of her thrillers, but they are not among my favourites. But the costume dramas – nope. Nary a one. I’m increasingly thinking I should remedy that. I’m finding a title like “Sylvester, or The Wicked Uncle” darned tempting! Remedy it soon, Barb! Heyer is not for everyone but given how many other favourite authors we have in common she is definitely worth a try. Great news, Barb! I can’t wait to read your review!!! One reason I’m excited to take on the “tbr double dog dare” challenge this year is that I have 3 or 4 Heyers in my tbr pile (I’m away from home at the moment, but think they are A Civil Contract, Grand Sophy, The Unknown Ajax and Black Sheep). I’ve only read a few Heyers but I was a big fan of regency romances when younger so I’m looking forward to some of her best. Now I’m sorry I didn’t add Sylvester at the same time I bought those! If you only have 3 or 4 Heyers to read, the ones you have are excellent! Good luck with the challenge. I’m hearing the Hallelujah Chorus in my mind — celebrating the completion of the Century of Reading (it deserves something rousing!). Great review and reminder that I am looking forward to more Heyer myself in January. Thank you, Susan. Enjoy your January with Heyer! 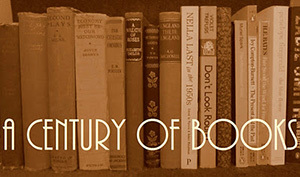 What an amazing thing to have achieved: the century of reading! Congratulations. I have a Georgette Heyer to try in my interminable TBR, bought for me by a friend who absolutely loves her. I almost don’t want to try her, for fear that I won’t like her and disappoint myself. It made for quite an interesting reading year, that’s for certain. As for fear of disliking Heyer, I am of the “it’s better to know the worst” school of thought. If you do love her, the sooner you get started the more time you’ll have to read and reread her books! Thank you for your review. I’ve read Sylvester more than once and your review brought the book to life! Thank you, Mystica. I sat down intending to write something much briefer than this but got carried away! As usual you have hit the nail on the head in analysing this very successful Heyer. Just like your comments on Angela Thirkell you make the non-reader realise how these novels, once cast aside as old-fashioned or genteel, still have a lot to say to us because they are so entertaining. What a lovely comment, Hilary. Thank you. I enjoyed reading your review! Both of the main characters feel so real; more than any other Heyer book, this one seems to demand a sequel! By the way, Sylvester’s nephew is Edmund.